1. 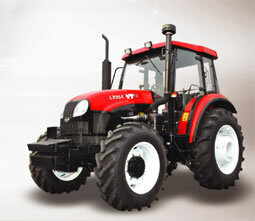 The 70-95HP wheeled tractor is equipped with 4-cylinder diesel engine produced from UK Racado technology. Besides the large torque and the strong power, this agricultural equipment consumes less energy during operation, which is conducive to low carbon emission and environmental protection. 2. Equipped with the transmission system designed on the basis of European technology, our product can be provided with 12F+4R, 12F+12R or 24F+8R gear. Additionally, the synchronizer for gear shifting is optional. It can provide smooth and safe gear shift to avoid parking during gear shifting. 3. The front axle of our 70-95HP wheeled tractor is manufactured according to the technology from Europe. So, it is reliable and durable for use. 4. Our wheeled tractor with cab employs LUK independently controlled dual clutch. The high reliability makes the operation available during gear shifting, resulting in higher working efficiency. 5. The hydraulic steering system installed with adjustable steering wheel can be manually controlled. So the operation of the four wheel drive tractor is quite comfortable. 6. High safety is ensured due to the wet disc brake. 7. For application in combination with more farm implements, our 70-95HP wheeled tractor is designed with synchronized and independent PTO double-speed power output. 8. The adjustable single or double-acting multi-way valve, as well as the 2 or 3 group hydraulic outputs, is conducive to the outstanding adaptability of our agricultural vehicle. 9. Besides the nice appearance, our fully enclosed cab can be equipped with air condition system so as to offer the driver a high level of comfort.